This tutorial will show you step by step how to rip music from an audio CD to your PC in a few different ways using free and paid software. You will copy songs from your music CD to your computer's hard drive in MP3 audio format, but you can also choose another audio format, like WMA, WAV or FLAC. What is ripping a CD? What is a CD ripper? A CD Ripper (also known as CD grabber, or CD extractor) is software that converts tracks on a CD to standard computer audio file formats, such as MP3, WMA, WAV, FLAC, or Ogg Vorbis. You want to burn music from your Audio CD to an MP3 CD. You just want to convert your music CD to MP3, WMA, WAV or FLAC. You want to listen to music from your CD on your portable MP3 music player. Your CD is damaged (smudges and scratches) and you want to try to save your songs. You want to copy music from your CD to the hard drive of your computer so that you can create a playlist and play the music on your PC. Your CDs won't last forever, so you might want to have backups of your music stored on a computer, USB flash drive, external hard drive or in the cloud (online storage). It also allows you to rip music from an Audio CD to your computer's hard drive, in MP3, WMA, WAV, FLAC or another audio format. 1. Insert the CD you want to rip into the CD/DVD drive of your PC. 3. In the left menu, you go to Audio + Music and then click on Rip Audio CD. Ashampoo Burning Studio will now check your CD. Ashampoo Burning Studio will try to retrieve information about your CD from the Internet. 5. If a CD selection window appears, then select your CD from the list and click on OK or click on Cancel. 6. You can uncheck the songs you don't want. 7. Click on the Next button at the bottom right. 8. Make sure that MP3 is selected at Output Options. 9. Click on Change Options. 10. At Profile, you select CD Quality and then click on OK.
11. At Output Folder, you can view and change the location on your computer where Ashampoo Burning Studio will save the songs. To change the location, click on the Browse button, select a location on your computer and then click on OK.
12. Click on the Rip button at the bottom right. Ashampoo Burning Studio will now rip music from your CD to your computer's hard drive in MP3 audio format. It also allows you to rip music from an Audio CD to your computer's hard drive, in MP3, WAV or another audio format. 3. In the left menu, you go to Music and then click on Rip Audio CD. Ashampoo Burning Studio Free will now check your CD. Ashampoo Burning Studio Free will try to retrieve information about your CD from the Internet. 8. At Output Folder, you can view and change the location on your computer where Ashampoo Burning Studio will save the songs. 9. Make sure that MP3 is selected at Output Options. 10. Click on Change Options. 11. Select a bitrate of 256 kBit/s or 320 kBit/s (quality) and then click on OK.
Ashampoo Burning Studio Free will now rip music from your CD to your computer's hard drive in MP3 audio format. You can download Media Monkey here. 3. In the left sidebar of Media Monkey, you click on the CD/DVD drive of your PC (example: E:\[Audio CD]). 4. Click on Rip Audio CD located in the top toolbar. 5. At Destination, you can view and change the location on your computer where Media Monkey will save the songs. To change the location, click on the small folder button, select a location on your computer and then click on OK.
6. Make sure that MP3 is selected at Format located at the top right. 8. At Use presets, you select Insane: CBR ~320 kbps - Highest Quality and then click on OK.
9. At Tracks to be ripped, you can select the songs you want to rip. 10. Click on OK located at the bottom right. Media Monkey will now rip music from your CD to your computer's hard drive in MP3 audio format. You can download FreeRip here. 3. At Output Folder, you can view and change the location on your computer where FreeRIP will save the songs. 4. 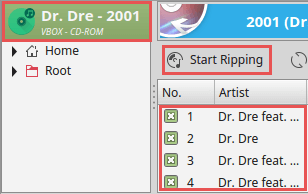 Make sure that Rip Selected Tracks to MP3 is selected at Ripping Options. 5. Click on Settings located at the top right. 7. Go to MP3 Encoding. 8. Click on Mode and then click on the [...] button at the right of VBR - Variable bitrate. 9. Select CBR - Constant bitrate. 10. Click on Bitrate and then click on the [...] button at the right of 192. 11. Select 256 or 320. 12. Click on OK to save the settings. 13. You can uncheck the songs you don't want to rip. 14. Click on the Rip Disc button located at the bottom. FreeRip will now rip music from your CD to your computer's hard drive in MP3 audio format. 3. In the left sidebar of Windows Media Player, you click on the CD/DVD drive of your PC (e.g., AlbumName (E:)). 4. Click on Rip Settings, go to Format and choose MP3. 5. Click again on Rip Settings, go to Audio Quality and choose 256 Kbps or 320 Kbps. 6. You can uncheck the songs you don't want to rip. 7. Click on Rip CD located at the top. Windows Media Player will now rip music from your CD to your computer's hard drive in MP3 audio format. Windows Media Player will save the songs in the Music folder on your PC. iTunes is installed on any Mac OS X computer by default and is updated through the App Store. 2. Insert the CD you want to rip into the CD/DVD drive of your computer. iTunes will try to retrieve information about your CD from the Internet. 3. If a CD Lookup Results window appears, you select your CD from the list and then click on OK or click on Cancel. 4. iTunes will ask you to import your CD into your iTunes library. This is not necessary for ripping your CD, so the choice is yours. 5. Click on Import CD. 6. At Import Using, you choose an audio format (e.g., MP3, WAV or ACC). 7. At Setting, you choose Custom. 8. At Stereo Bitrate, you select 256 kbps or 320 kbps. 9. Click on OK to save the settings. iTunes will now rip music from your CD to your computer's hard drive in MP3 audio format. K3b can also be used for ripping (copying) music from an audio CD to your PC's hard drive in MP3 audio format. 1. Insert the CD you want to rip into the CD/DVD drive of your computer. 3. In the top left section of K3b, you click on your CD. In the right section, you will see the songs that are on the CD. 4. You can uncheck the songs you don't want to rip. 5. Click on Start Ripping located above the songs. A CD Ripping window will appear. 6. At Filetype, you click on the selection menu button and select MPEG1 Layer III (mp3). 7. Click on the button next to the selection menu button. 8. Click on Manual settings. 9. Click on the Change Settings button. 10. At Constant Bitrate, you click on the selection menu button and select 256 kbps. 13. At Target Folder, you can see the location on your PC where K3b will save the songs. To change this location, click on the button, select a location on your computer and then click on OK.
14. Click on Start Ripping. K3b will now rip music from your CD to your PC's hard drive in MP3 audio format.